During football season, you might be inclined to stay closer to home so you never miss any of your favorite football games on TV. However, why should a few hours of TV keep you from exploring our great country? It doesn't have to when you install one of our many RV TV Antennas. Since television signals went digital, it means that when an antenna picks up a channel it comes in crystal clear. The fuzzy picture you remember from antennas in the past doesn't exist anymore. You either get the channel or you don't, and when you get it the picture is just as perfect from an antenna as it is from cable or satellite dish. 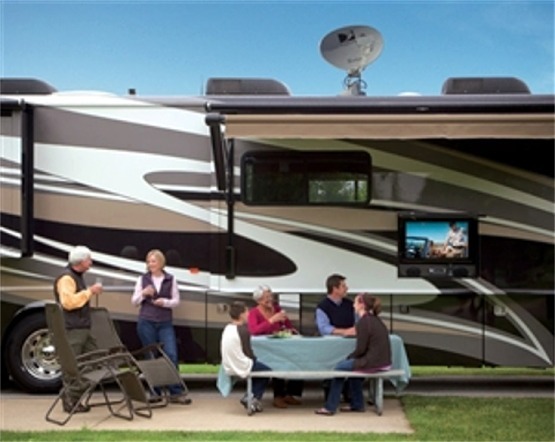 Plus, in your RV you have the advantage of being able to move to a new location to pick up the channels you want, and since football games are broadcast on the local channels they are really easy to pick up. The Winegard RV- RZ50 antenna has excellent reviews from happy customers and gets great signal on local channels, or try the amplified antenna if you want to be sure you can pull in the channels you want even in more remote locations. These two are indoor only installations and only receive the local broadcast channels but Winegard also makes antennas that can be used outside and work off the satellites to bring you many more channels. The satellite ones include the Carryout Anser and Pathway X2 which are both portable and have to be used stationary. Trav'ler is one that is mounted to the roof of the RV and is used stationary. Then there is the Roadtrip Mission in Motion, which is great for the RVer that has a family and they are constantly on the road. It can get great signal whether you are driving or parked and will keep the kids busy during the long drive to your destination. If you decide upon a satellite antenna you will have to make sure you get a receiver and depending on the satellite you choose, it will tell you the type of receiver it is compatible with. Another great brand for RV antennas is King Controls. If you are only looking to get locally broadcast stations then the Jack Over The Air would be perfect for you. The King has two satellite antennas the Tailgater which is for anyone that is wanting to use a DISH receiver and the Quest for someone that wants to have DIRECTV. There are many RV Accessories to make your RV feel like home, TV Antennas are just one of them, Check out our many other products at RVupgrades.com. 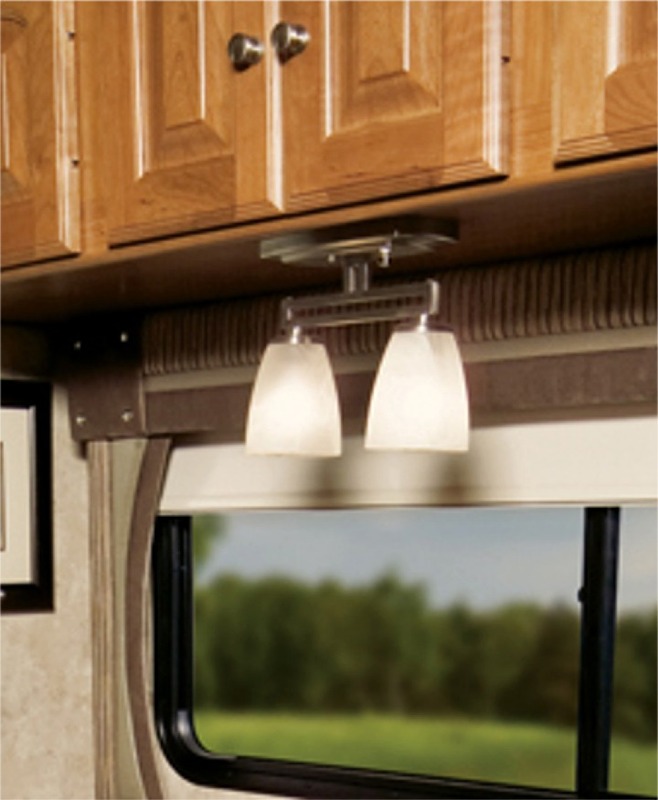 When remodeling your RV one of the first things you may consider in the process is upgrading your interior lights. If you are still running on the old standard bulb light fixture or the ones you have are just old and dull, then maybe its time for a change. Checkout our wide selection of different fixtures that are sure to match your decor and give you the light you need in any area of your RV. There are many things to consider when upgrading the lighting in your RV. One thing is, what is the theme or decor style that you are trying to achieve with this upgrade. Lighter color themes, you may want to use brushed nickel finished fixtures, versus darker colors, you might want like a bronze finish on the lights. Second, where are they getting placed in the RV? If you need lights for the ceiling, most likely you are going to want a round flat light or an overhead light. The more decorative ones would be the reading, wall or even the dinette light. The reading and wall lights are perfect for the bedroom and or the living area in places where you need less light or directional light. Dinette lights are great for the kitchen, we also have vanity lights, best for brightening up the bathroom. Third is, what type of light bulb are you looking to use? Incandescent have softer light but are not energy efficient, fluorescent is brighter but is also not energy efficient, or LED which is bright, long lasting and saves energy. Some fixtures can only use certain types of bulbs, so be aware when choosing. Last would be your budget, making sure you choose great looking fixtures and a decent price. Speaking of decently priced, check out the newly added ITC RV Light Fixtures. These designs are not only gorgeous but they are functional and low priced. They include everything from overhead, reading/directional, pin up, under-cabinet/dinette, vanity and many more other light fixtures to choose from. Still can't find what you want check out our other brands like Gustafson, Progressive Dynamics or Diamond Group to find what your RV needs. If you have any questions or need help finding or choosing the best light fixtures for your RV interior remodel, please contact us and we would be glad to help you. It's that time of year again when many people put there RV in storage for the winter, but for those that go camping year round, rain or shine, how do you manage to keep your carpets clean. 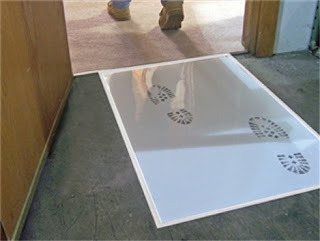 If you're the type that will follow peoples foot steps through the RV with a spot cleaner, then you ought to check out these unique accessories for your RV carpet protection. Many people when entering an RV don't take their shoes off because most of the time it's just to run in and grab something. They end up getting mud or dirt tracked in and then you got to be the one that cleans it. Especially with kids around they love to get dirty and with this time of the year, the campsites are muddy from the rain. For these reasons, we have Surface Shields, choose from rolls of plastic that stick to the carpet to the popular step and peel mats, where anything on the bottom of your shoes will get stuck to the mat. Next is Plasticover, which lets you cover your motor home's carpet with a plastic film that will protect it from spills, stains, mud and dirt. You will have so much more fun with your family or friends, if you're not constantly worried about someone wrecking the carpet. Plasticover is an adhesive plastic that comes in a 24" wide roll. The roll comes in 200 or 500 feet, so it will cover a really wide area a few times over. Once you have applied the Plasticover, it will last for 60 days. This is over twice as long as many competing products. Plasticover and Surface Shield is easy to install and the fact that it does not create a slippery surface, makes it a safe addition to your motor home. For more information on all your motor home or RV accessories, please contact us. Depending on what climate you’re in, you may not be able to use your RV all season long. If you plan on putting your RV accessories on hold for the winter, here are a few RV accessories you should really use in order to make sure that your vehicle is properly winterized and doesn’t sustain any damage while you aren’t using it. A blow out plug will allow you to connect your water lines and completely drain your RV of all water in preparation for winter. Using this device, you can connect an air pump and open all of your faucets and drains in order to get all of the water out if you decide to do this. This gadget lets you hook up a bottle of anti-freeze and connect the water pump you already have in your RV in order to keep the vehicle good to go throughout the winter. It’s important to choose a pump that has a sturdy material for the valve, such as brass. Using a pump converter to put anti-freeze into your water system, will help make sure that the pipes in your RV don’t freeze and crack during really cold winter temperatures. 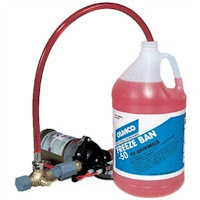 Stop wasting antifreeze while winterizing your RV's water system and get a water heater by-pass kit. This kit is made to by-pass the antifreeze, keeping it from going to the water heater. This will save you a lot of money by not having to use as much antifreeze. It gets installed for the winter and then when spring hits, remove it and reconnect the system. For more information about RV accessories you can use for winterizing your recreational vehicle and other purposes, please contact us.